In a dramatic reversal of her recent defeats in the House of Commons, on Wednesday British Prime Minister Theresa May won overwhelming support for a motion noting her statement to the House the day before on leaving the European Union and the ongoing discussions between the UK and EU about the Irish backstop. A cross-party amendment reiterating her commitments in the statement in regard to future votes was adopted by a vote of 502 to 20 and the amended motion was approved by a unanimous voice vote. Those votes represent a quite remarkable reversal of parliamentary fortune for the prime minister after the defeats suffered on January 15, when the House rejected the withdrawal agreement and political declaration on the future relationship by a vote of 432 against and 202 in favor, and again on February 14 when it rejected, by a vote of 303 against and 258 in favor, a motion welcoming her statement two days earlier on the government’s effort to secure a deal – most notably, by trying to persuade the EU to replace the Northern Ireland backstop with “alternative arrangements” to avoid a hard border. Instead, it reflected the fact that, after the resignations from the party last week of three Conservative M.P.s, two of whom – Anna Soubry and Sarah Wollaston – have been high-profile participants in the parliamentary debate over Brexit; the possibility of further resignations from the party including such prominent figures as former Attorney General Dominic Grieve and former minister Justine Greening; the threat of three influential members of the government – Amber Rudd, the Secretary of State for Work and Pensions; Greg Clark, the Secretary of State for Business, Energy and Industrial Strategy; and David Gauke, the Secretary of State for Justice and Lord Chancellor – to vote against the government, if necessary, for a delay in the exit if there is no approved agreement; the possibility of a dozen or more resignations from the government if the prime minister continued to refuse to rule out a no-deal exit on March 29; and the increased alarm in the business community and the public in general about the disastrous economic consequences of a no-deal Brexit, the prime minister finally modified, to some degree, her long-standing position that the UK would leave the EU, with or without a deal, on March 29. Project Fear didn’t work in persuading a majority to vote for Remain in the 2016 referendum and it obviously hasn’t persuaded a majority in the House to support the withdrawal agreement either, largely because most of those opposed to the agreement – most notably, many Conservative members, including those in the anti-EU European Research Group, and the members of the Democratic Unionist Party of Northern Ireland – would be very happy to leave without a deal. The prime minister’s position might make sense if she presided over a government that enjoyed a large and secure majority in the House. But she doesn’t, and insisting on a position that drives party members to the Opposition benches and ministers out of the government can only be regarded as politically misguided and likely to increase the odds that, sooner rather than later, the government will face and lose another vote of no confidence and, in all likelihood, find itself, occupying the Opposition benches after the next election. Finally, under political duress, the prime minister seems to have realized that. 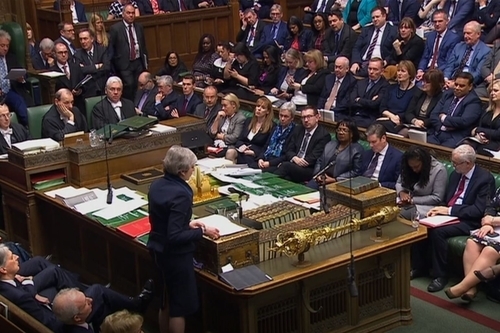 Recognizing the peril to the party and her government, the prime minister made three commitments to the House in her statement: First, the government will hold a second “meaningful vote” on the withdrawal agreement and political declaration by Tuesday, Mar. 12 at the latest. Second, if the agreement and declaration have not been approved by that date, it will table a motion to be voted on Wednesday, Mar. 13 at the latest, asking the House if it supports leaving the EU without an agreement and framework for the future relationship, which means the UK won’t leave the EU without a deal unless the House gives its explicit consent. Third, if the House rejects the agreement and declaration by Mar. 12 and also rejects leaving the EU without an agreement by Mar. 13, the government will, on Thursday, Mar. 14, bring forward a motion on whether the House wants to seek a “short limited extension” of Article 50 and, if it does, seek to agree on such an extension with the EU and bring forward the legislation required to change the exit date. Those commitments, reiterated in a cross-party amendment to the prime minister’s motion put forward by Sir Oliver Letwin, a Conservative, Yvette Cooper of Labour, and others, were supported by 502 members and opposed by only 20. The commitments obviously don’t take a no-deal Brexit off the table but they do at least give the House the power to decide the matter, and it has already voted, in a non-binding amendment on January 29, that it rejects leaving the EU without a withdrawal agreement and framework for the future relationship. There can be little doubt, then, that, if the withdrawal agreement is again rejected, the House will, on Mar. 13 at the latest, reject leaving the EU without a deal and will, on Mar. 14, vote on whether it wants to seek a “short limited extension” of Article 50. Such an extension might – if, for example, it extends no further than June 30 – have the advantage of allowing the UK not to hold the election in May for the European Parliament, since the UK would presumably have left the EU by the time the new European Parliament takes office. A longer one, extending beyond June 30, would require the UK to hold the election. On the other hand, it’s not obvious that, if the House again rejects the agreement, the issues standing in the way of approval can be resolved at all, much less in a short period of two or three months, and the EU has indicated it is disinclined to provide a short extension unless there is some reason to think it would culminate in an approval. Yesterday, for example, President Emmanuel Macron said, “we could examine a request for an extension, if it is justified by new choices by the British. But under no circumstances would we accept an extension without a clear perspective.” And recently, European Council President Donald Tusk suggested any extension should be a long one – possibly to the end of 2020 – so the issues pertaining to Irish border could be resolved prior to the UK’s departure, thereby obviating any need for the backstop. With possibly three votes in regard to Brexit in the next two weeks, the most important question at this point is whether the UK and EU will agree on the “legal changes that are required to guarantee that the Northern Ireland backstop cannot endure indefinitely” and, if so, whether those changes will persuade a majority in the House to approve the withdrawal agreement and declaration on the future relationship. In a series of discussions over the past two weeks between the UK Secretary of State for Exiting the EU Stephen Barclay, the UK Attorney General Geoffrey Cox, and Michel Barnier, the EU’s chief Brexit negotiator, the UK has acknowledged the backstop can’t be replaced with “alternative arrangements” at this point; the EU will not reopen the withdrawal agreement and the “alternative arrangements” that might replace the backstop don’t currently exist. The UK has accepted, also, that, because the agreement can’t and won’t be reopened, the backstop can’t be “time-limited” and its applicability can’t be unilaterally terminated by the UK. So what is left is for the UK and EU to agree, as Prime Minister May said Tuesday in her statement, “legal changes” to guarantee that the backstop won’t “endure indefinitely” – i.e., that it will be temporary – so the attorney general can walk back his written advice to the government that the backstop will apply “indefinitely.” Precisely how the UK and EU will say, persuasively, that “indefinitely” means “temporary” remains to be seen. Notwithstanding that semantic difficulty, the UK and EU have been working on several fronts to make it possible for the UK to approve the agreement. As European Commission President Jean-Claude Juncker and Prime Minister May said last week in their joint statement, there are three strands in their discussions: First, concerning the content and form of guarantees that could be given with regard to the backstop that underscore its temporary nature and give legal assurances to both sides, an issue that is being worked by Cox and the EU lawyers and may result in agreement on a Joint Interpretative Instrument. Second, the role alternative arrangements could play in replacing the backstop in the future, an issue that Barclay and Barnier will be working on and that will be examined once negotiations concerning the future relationship begin. Third, whether there are additions or changes that can be made in the non-binding Declaration on the future relationship that would, consistent with EU and UK positions, increase confidence in the focus and ambition of both sides to deliver the envisioned future relationship as soon as possible, an issue that Barclay and Barnier will follow up on. Will these efforts produce, without reopening the withdrawal agreement, the additional changes, assurances, and guarantees necessary to persuade a majority of the House to approve the agreement and declaration, thereby enabling the UK to leave the EU on March 29? Or will they turn out to be insufficient to reverse the massive defeat that occurred on January 15 and, if so, will the UK request and receive an extension of Article 50? Or will the House, now empowered, decide on some other course of action – for example, a People’s Vote or revocation of the Article 50 notification? We’ll know in two weeks. The EU made use of a JII in 2016 to address concerns that threatened to block approval of the EU-Canada Comprehensive Economic and Trade Agreement after all of the member states except Belgium had approved it but Belgium had not because the regional parliament of Wallonie refused to approve it. (In Belgium’s decentralized federalism, the regional parliaments as well as the national parliament must approve international treaties.) The CETA JII addressed the regional parliament’s concerns and allowed it, and Belgium, to approve the agreement. Whether a JII in which the EU gives, as Barnier said, “further guarantees, assurances and clarifications that the backstop should only be temporary” will persuade a majority of the House of Commons to approve the withdrawal agreement remains to be seen. Certainly, the UK, for its part, would prefer the JII to say the backstop “will only be temporary” rather than “should only be temporary.” Still, it may be enough.